May will be a month of rookie invasion! Fans can look forward to meeting rookie boy group A-Prince for their first ever showcase in Singapore! JNation Entertainment presents A-Prince Showcase Live In Singapore on 18 May 2013 at the DBS Arts Centre. A one-night only event, the showcase promises to be one filled with fun and excitement. It will feature interactive activities for fans to get an up-close opportunity with the members. A-Prince will impress with songs off their debut mini-album. 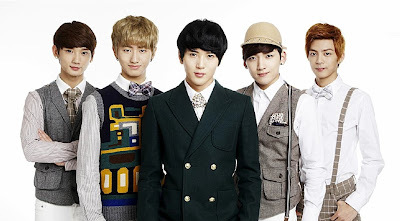 Comprising of 5 members; Leader Sungwon, Minhyuk, Seungjun, Siyoon and Woobin, A-Prince first received much attention from their pre-debut single 'You're The Only One' which was written by MBLAQ's vocalist, G.O. The New Planet Entertainment's boy group then debuted in November 2012 with the mini-album 'Hello'. A-Prince has also ambitiously ventured into the Japan market with promotions and holding a showcase followed by their first solo concert in Tokyo last December. Barely two months into their debut, their daring move paid off. A-Prince’s successful Japan concert attracted more than 1,000 fans, an amazing feat for a new group. Their talents were recognized during the Asia Model Festival Awards 2013 in Seoul, where A-Prince was awarded the K-Pop Rising Singer Award. They also bagged the Rookie Award at the Korean Culture Entertainment Awards. A-Prince is definitely one rookie group to keep a look out for! The fresh voices of Korea's up and rising princes will brighten up your day! *Only 300 tickets available for the showcase only. For more information, head over to JNation’s Facebook and Twitter page.